Porcelain & Ceramic Tile, Stone, Laminate, and Hardwood Flooring Liquidation! Pallet Jacks, Janitorial Supplies and MORE!!! 101.75 sq ft total. Some pieces are damaged. All natural stone. 148 sq ft total. Some is new in box, some is out of box. 187 sqft of Moonbeam Hickory 5-1/4" wide engineered hardwood flooring. 169 sqft of Natural Maple 5" wide engineered hardwood flooring. It is cabin grade, so it will have some knots and pit-holes, and shorter boards. Some in new boxes, some pieces loose. Builders grade tile. Most new in boxes, a few pieces are loose. 124 sq ft total. Some is new in box, some is out of box. Laminate flooring is a floating, click-together floor. The planks interlock, with a wood-look print on the surface. This is a B grade product. Some boxes are open. 84 sqft of Natural Oak 3" wide engineered hardwood flooring. 160 sqft of 5-1/4" wide Lakemont Oak engineered hardwood flooring. 113 sqft of 3" wide Gunstock Oak engineered hardwood flooring. It is cabin grade, so it will have some knots and pit-holes, and shorter boards. Some pieces are loose/out of box. 160 sqft of 5-1/4" wide engineered hardwood flooring. 169 sqft of 5" wide French Roast Oak engineered hardwood flooring. 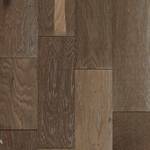 3 different styles of laminate flooring. 11.5mm thick, click together flooring. 7 boxes are in this lot. 131 sq ft total. Most are new in boxes. A few loose pieces. Great for floor or wall. Most new in boxes, some loose pieces. All new. B Grade product. Click together product. Price is per box. 59 Sq Ft of Gray Stone-Look 'Silvered Avenue" Laminate Flooring New in Boxes. 11mm thick. B Grade Product, click together product. Price is per box. Gray wood-look color. Luxury Vinyl Tile product. Click and locks together for waterproof surface. 28 boxes plus loose pieces. Price is by box. 56 sqft of 5" Hickory Gunpowder Engineered Hardwood Flooring. Mohawk Brand. Porcelain tile that looks like wood. Some pieces are out of the box, the rest is new in box. 60 Sq Ft of Wood Look Porcelain Floor Tile. Planks are 8" x 48"
Most pieces are loose, out of box. 6 boxes of 12x12 tile. New in box. Price sold is by box. Natural stone mesh. Great for backsplash. 9 total pieces. 1 sq ft each. 36 sq ft of 18x18 travertine. Most of the travertine is still in boxes. Half is loose, half is new in boxes. Each plank is 6" x 24". Some loose pieces in this lot, some chipped corners, most still in box. Most is new in boxes. Each plank is 6" x 24". Most new in box, with a few loose pieces. 157 sq ft total. Some is new in box, some is out of box. Half loose, half new in box. This is not premixed. Must add water. Each pail is a different color.